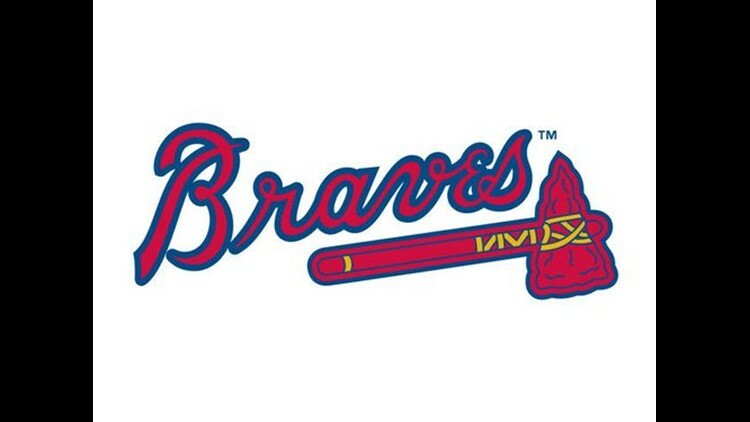 Ozzie Albies led off the seventh inning with a tiebreaking homer, one of three hit by Atlanta, and the Braves overcame 19 hits by Milwaukee to beat the Brewers 8-7 on Sunday. Ronald Acuna Jr. and Dansby Swanson hit two-run homers for Atlanta, which took two of three in a matchup of playoff contenders. Jesus Aguilar drove in four runs with three hits, including a three-run homer, for Milwaukee. The Brewers left 13 runners on base. The Brewers' inability to deliver with runners on base reached a peak in the seventh. Facing Jonny Venters (2-1), Ryan Braun hit into a bases-loaded double play to end the inning. A.J. Minter pitched the ninth for his 10th save in 11 chances. Eric Kratz hit a one-out single before Lorenzo Cain, who had four hits, flied out. After Kratz moved to second on a wild pitch, Minter struck out Christian Yelich to end the game. Albies gave Atlanta the lead by lining his 21st homer over the left-field wall on a slider from Dan Jennings (4-4). Sean Newcomb's stretch of allowing one earned run in three straight starts for the Braves ended with a short outing against the Brewers. Newcomb lasted only four innings, giving up five runs on 12 hits and two walks. The left-hander was tagged for a combined 10 runs on 17 hits in 7 2/3 innings in two starts against the Brewers this season. Brewers starter Chase Anderson also was pulled after four innings, giving up four runs on five hits and two walks. Anderson, who took a .088 batting average into the game, enjoyed a rare hitting highlight, as he slapped an 0-2 pitch from Newcomb up the middle for a two-run single in the second. Freddie Freeman stretched his hitting streak to 14 games with a first-inning double before scoring on a triple to the right-field corner by Nick Markakis. Johan Camargo added a run-scoring single for Atlanta. Brewers: RHP Kyle Davies (right shoulder) will join the Brewers in Chicago, but will make at least one more minor league rehab start after permitting four runs in five innings for Double-A Biloxi at Tennessee on Saturday. ... RHP Taylor Williams (right elbow) had what manager Craig Counsell called a "positive" bullpen session and could come off the 10-day DL without a minor league rehab. ... C Manny Pina left the game one inning after being hit by Freeman's foul tip in the fifth. Braves: LHP Sam Freeman (left shoulder inflammation) reported to Class A Rome. Freeman had a 5.45 ERA in 49 games when he was placed on the 10-day DL on July 30. Brewers: Following an off day on Monday, RHP Jhoulys Chacin (11-4, 3.91) will start when Milwaukee opens a two-game series at the Cubs on Tuesday. Chacin struck out while pinch-hitting for Anderson in the fifth. Braves: RHP Touki Toussaint will be recalled from Triple-A Gwinnett to make his major league debut in the first game of Monday's split doubleheader against Miami. Toussaint, 22, joins Mike Soroka and Kolby Allard as first-time starters for Atlanta this season. RHP Mike Foltynewicz will start the night game.